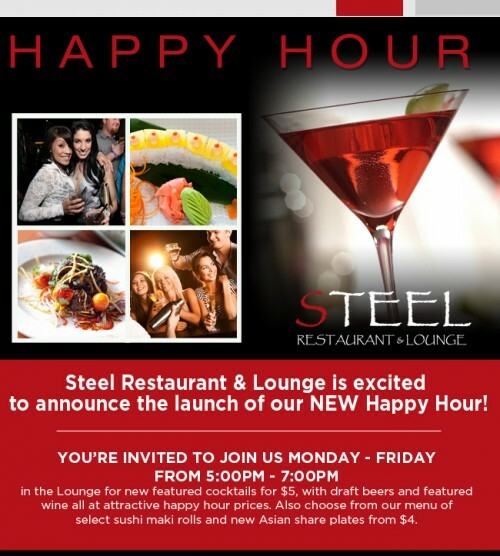 Steel is the perfect place to unwind and enjoy your evening. Beginning at 10 pm on Friday and Saturday, enjoy discounted appetizers like Chef inspired rolls, yakiniku beef and house favorites like the Sea Salt Chili Pepper Calamari and our delicious $5 signature martinis or sake, you can relax with friends or complete a date in our beautiful ambiance. Unwind after work at Steel in a vibrant, cool setting with great music, food, and drinks. Join the fun and enjoy featured appetizers, and special pricing on our signature cocktails, beer, wine, and sake. Steel is pleased to offer complimentary plates of sushi (with 2 drink minimum purchase). Enjoy a bottle from Steel’s Wine Spectator Award-Winning wine list at a special price every Sunday evening. All bottles on the Sunday wine list are 50% off with dinner.